Yesterday, my dad brought me 3 or 4 big freezer bags full of sour cherries from my grandpas cherry trees. That’s a lot of cherries, folks. My mind was racing with possibilities, cherry pie, cherry tarts, oh so much tastiness to be had. I really wanted to make them last though, be able to enjoy them for a while. When my mom mentioned jam, I knew that was the answer. Before today, I had never tried my hand at making jam. I’ve wanted to for ages, but I’ve always put it on the back burner, one of those “I’ll get to it eventually” kind of things. I don’t know why I put it off - this recipe is so easy, no matter your experience level, you can do it. We’re already off to a good start, huh? I’m not going to lie to you, this takes some time. You have to wash the cherries, pit them, stand over them while they cook, and then stir and stir and stir while the jam does it’s thing. It’s so worth it though, the end result is so much better than anything you can by at the store. It's sweet, with just a hint of tartness. It even beats my very favorite, Bonne Maman. The greatest part of this recipe is that you don’t have to go out and purchase a hot water canner. Just sterilize your jars, screw them tight, let them cool and stick in the fridge. We ended up with about 8 half pint jars, so I’m going to put some in the freezer too. This would be a great weekend project! You get sticky up to your elbows, and your hands seem to be permanently stained red, but it’s tons of fun. Try it out! Like my adorable canning labels? They’re from Eat Drink Chic! A couple of tips: If you are making a lot, step 6 is going to take a while. We had 8 cups of cherry/sugar mix, and to get to the gelling point, it took about 45 minutes. Be SURE to stir constantly, you don’t want cherry carmel. Stay by that pot and watch it like a hawk. The plate and the freezer never worked for me. When it reached the point of sheeting off the spoon, that’s when I turned the pot off. 1. Buy as many cherries as you feel like pitting. Whatever variety you’d like. Mine were sour cherries. 2. Rinse the cherries and remove the stems. Pit the cherries. Chop about ¾ of them into smaller pieces, but not too small. Leave some cherries whole so people can see later on how hard you worked pitting real cherries. If you leave too many whole ones, they'll tumble off your toast. 3. Cook the cherries in a large non-reactive stockpot. It should be pretty big since the juices bubble up. Add the zest and juice of one or two fresh lemons. Lemon juice adds pectin as well as acidity, and will help the jam gel later on. 4. Cook the cherries, stirring once in a while with a heatproof spatula, until they're wilted and completely soft, which may take about 20 minutes, depending on how much heat you give them. Aren't they beautiful, all juicy and red? 5. Once they're cooked, measure out how many cherries you have (including the juice.) Use 3/4 of the amount of sugar. For example if you have 4 cups of cooked cherry matter, add 3 cups of sugar. 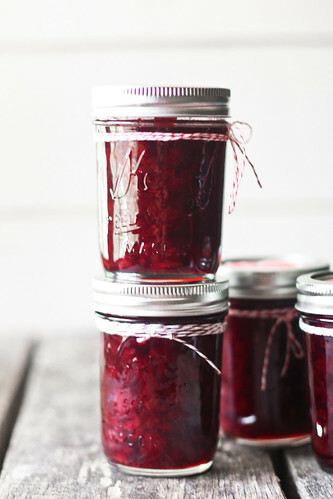 It may seem like a lot, but that amount of sugar is necessary to keep the jam from spoilage. 6. Stir the sugar and the cherries in the pot and cook over moderate-to-high heat. The best jam is cooked quickly. While it's cooking, put a small white plate in the freezer. Remain vigilant and stir the fruit often with a heatproof utensil. Scrape the bottom of the pot as you stir as well. 7. Once the bubbles subside and the jam appears a bit thick and looks like it is beginning to gel, (it will coat the spatula in a clear, thick-ish, jelly-like layer, but not too thick) turn off the heat and put a small amount of jam on the frozen plate and return to the freezer. After a few minutes, when you nudge it if it wrinkles, it's done. If not, cook it some more, turn off the heat, and test it again. If you overcook your jam, the sugar will caramelize and it won't taste good and there's nothing you can do. Better to undercook it, test it, then cook it some more. Ladle the warm jam into clean jars and cover. Cool at room temperature, then put in the refrigerator where it will keep for several months. I LOVE homemade jam!!!! One thing that I think is essential is a magnetic want. It really helps to pick up the lids from the hot water. Ouch! oh man - that looks gorgeous. and i bet it tastes just as yummy. 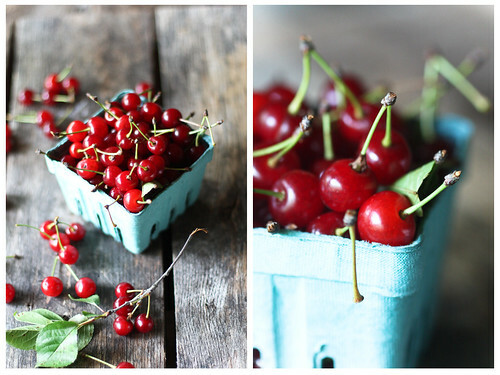 these jars of cherry jam look so enticing and delicious! i was just thinking about making jam! i am so glad you posted this recipe! 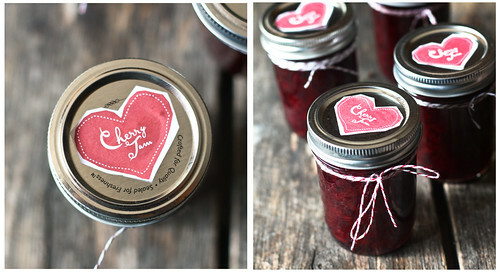 i love the red and white bakery string you tied on the jars and the heart labels on top! that totally completes the package! so appealing!!! you are so talented! Sounds divine and super easy! Thank you for sharing!!! Hannah, I loved reading about your first jam adventure. When I was 15 my parents were away for the day and my sister & I made jam for the first time. We were up to our ears in raspberries that summer. 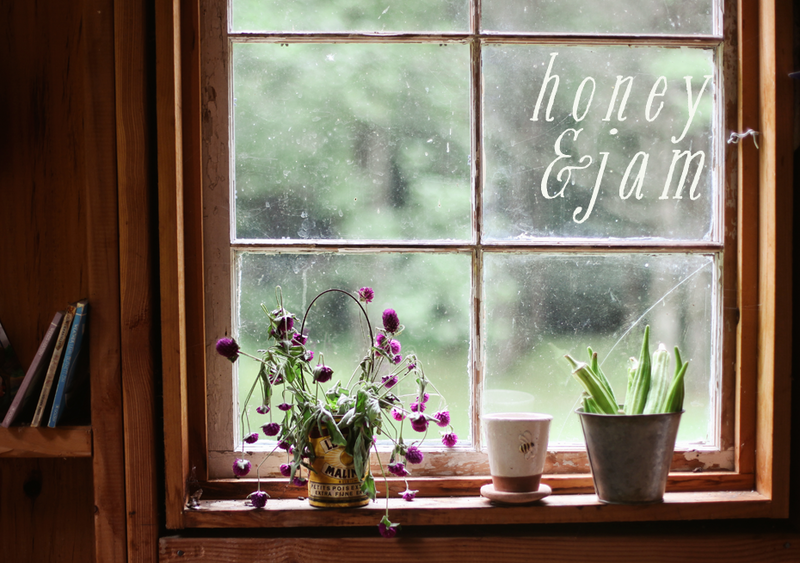 :) We were thrilled to discover how simple, satisfying and AMAZING homemade jam is! Now I live in a city and don't have a raspberry patch so every summer I'm homesick for fresh jam... glad you're enjoying it though! Those are some gorgeous cherries! And what a perfect gift that jam would make! I love how bright the cherries are in all the photos! Great job and a wonderful recipe! You are so creative! Maravillosa! y una presentación excelente, no sé porque dejaste tanto tiempo en prepararla, te ha salido RIQUISIMA! And these labels are so cute ! 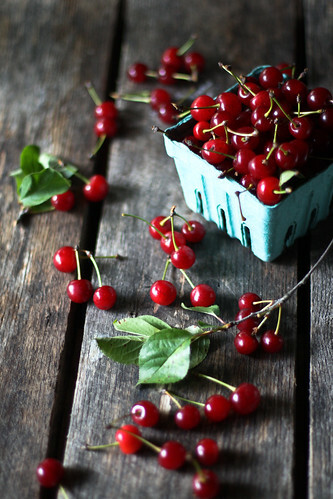 We get sour cherry jam in Michigan every summer and it is so delicious. Love that you made some! Yum cherries. Yum free cherries. Yum cherry jam. I like recipes that don't use the canner or pectin. that intense red is so beautiful! we had a cherry tree at home, only one left from my grandpa's legacy, but it died in a harsh winter :( that tree made me love cherries and this jam would bring me back to being 10! delicious! Perfection! Your photos are amazing! The jam looks like a winner! I wish I knew someone with a sour cherry tree! I made plum jam for the first time last summer and homemade jam is so amazing. Your jam looks beautiful! I'm glad you took the jump and made jam - it is so satisfying to put fruit on the shelf for a later day! (or not so later, depending on how fast it's eaten. very fast, in our house...) You can oven sterilize for almost all jams, if you have the freezer space, and actually, they'll sit on the shelf for a few months just fine. This looks amazing! I may have to make this my weekend project! Delicious recipe and so beautifully presented. I love sour cherries, especially in jam form. What a perfect project! My grandmother's tree is covered with sour cherries, and I've been wondering what I can do with them! Your post came at a great time. Your jam looks wonderful!! This is my absolute most favorite of jams!! AND I love how you pkg it!! Too cute and gorgeous photo's as always! I have never wanted to stand over a hot stove on a 80 degree day as much as I do right now! Gorgeous photos! Marvelous recipe! Now if I can just get my hands on some sour cherries! Home made jam really is so much better than what you can buy (even Bonn Maman! ) and even if it's long and tiring to prepare, the result is as wonderful as your photos! Isn't Jam making addictive!!! I don't think we get sour cherries here much...but I'll try my hand and just regular cherry jam! Hannah, would you consider selling me a print of your cherries photo? Do you have an etsy shop? I just spent so much time going through it and bookmarked a handful of recipes that I'm excited to try. The photos on here are spectacular as well! This makes me want to take out my canning jars right away! I invested in a cherry pitter last year when I went on a streak of making cherry clafoutti during cherry season . . . it was well worth it! This jam makes me want a big flaky croissant with dollops of sweet butter and sour cherry jam! Your pictures are beautiful! 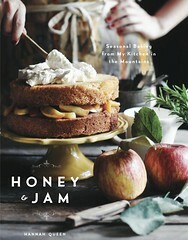 i love recipes with the simplest ingredients :) gorgeous photos! I made blackberry caramel last year. It made me very sad. Your jam looks wonderful. Good job!! Hot diggity! I happen to have 8 pounds of sour cherries on hand, and no jamming experience whatsoever. Love the idea of avoiding the hot water canner. Oh, how gorgeous! And a perfect way to preserve those tart cherries. Although my favorite to use tart cherries is probably cherry pie - worlds better than any other cherry pie! Gorgeous pictures! Sour cherry jam sounds delicious. They make me want to go out and buy some cherries too. What a great recipe! Your photos are still amazing ! And the homemade jam : yummy, I love it ! So sweet! Amazing photos ! 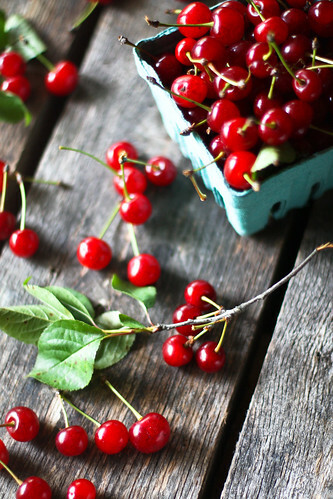 Wow- do you know how lucky you are to have those cherries? Those are sooooooooo hard to come by - Beautiful work! Wish I could consistently find sour cherries around here. They only appear for a week at the farmers' markets! Once again your photos are delectable! It is always a pleasure to see what you are up to. The jam looks lovely... And, all of your photos of the cherries are absolutely stunning as always! I love homemade jam. I grew up in Northwest Michigan, and tart cherries are a HUGE deal. Stirring is always worth it when tart cherries are involved. I have had a sour cherry tree in my garden for about 5 years now since moving into a new place. Each year I just let the cherries get eaten by the birds or rot on the tree/ground. Today I just made two jars of home-made cherry jam. Having had a small taste I don't think the cherries will ever be left to spoil again. I'm going to try this recipe with Flathead Cherries, wish me luck! And how long does the cherry jam last, if stored? This cherry jam looks so beautiful! I tried my hand at making some over the summer and did a horrible job at paying attention during the stirring portion of the recipe and ended up with blackened and burned cherry jam. Needless to say I was a little disheartened after all that work pitting them, but your jam makes me want to try again this summer! Just made this jam and it turned out very well. Instructions were very clear and helpful. This is my first time jam making and am very pleased with results. Have my own cherry tree and have been cooking with cherries all week. Wanted to try something beside pies and crips. Thought jam making sounded fun and could easily be shared. Will be making again! Wow. This is a great idea. I’m going to pick cherries off a neighbour’s tree in the summer and I think even I could do this canning procedure. Dumb question – when you “process for 10 minutes” is the water over the lid of the jar (I’m too lazy to look this up right now). I better go to a bania restaurant and order some there. I have teach you how to make a good search engine optimization service. I have a question, would it work to pour a little of vodka over the jam before closing the lid? § مكافحة النمل الابيض "الارضة"